Team Fortress released recently a big update that included the competitive mode and the quick play matchmaking mode. I have only read the patch notes since, well, I don’t play Team Fortress 2 that much anymore because Overwatch. Going back, after I read the update, I thought to myself, “Wow pretty cool! Valve is putting an effort to compete in the FPS market again.” But then it hit me, “This sounds a lot like Overwatch.” Maybe it was just me. Until I found a video that reaffirmed my assumption after reading the patch notes. This is going to be bad for TF2 trading. I loved the “Overwatch is doing great with it, let’s do it as well” comment. For one, I really thought of the idea when I read the update notes and Muselk seconding the thought, what a relief for me. Valve doesn’t have to do that. They were first in the market anyways, they could’ve done that a long time ago and maybe got the success of that idea before Overwatch. Who knows, that would be another “TF2 did it first” argument and Valve could’ve gotten the credit and not Blizzard. What’ surprising was the ranked rating. You did great in a game with three gold medals and won and still ranked down? Maybe this was a bug but with the anxiety of the remaining handful (LOL) of Team Fortress 2 players, it’s almost unforgiveable. Valve is a veteran in the industry as well, they should know better. 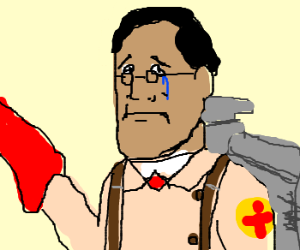 The last thing to cry about is that Valve is as if they are just giving TF2 players disappointment after disappointment as if they don’t care anymore. I really anticipated that Overwatch will bring the best out of Valve but it was otherwise. TF2 items surely will not sell again.